Network Blather: more than a thousand times better than the nexus 6! take that, roy batty. more than a thousand times better than the nexus 6! take that, roy batty. 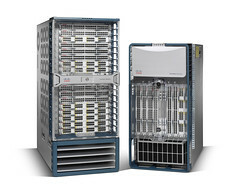 Cisco's hot new multiservices platform is the Nexus 7000. I haven't actually laid hands on one, but I figured I'd read up on them a bit. Thus, I blog about it. It's a move away from IOS-based platforms -- it runs a newfangled "NX-OS". It's a big-assed chassis switch that runs either 10 or 18 modules; each of those configurations takes two supervisor modules, like the old supervisor cards on the Catalyst switches. 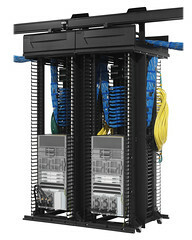 The bigger chassis can take up to 516 gigabit ethernet connections which is some pretty beefy port density, right there. The OS, NX-OS, has a similar CLI as IOS to keep with the cisco look and feel, but it is apparently a completely different beast than IOS under the hood: it's built on an embedded Linux kernel. (Historical trivia: IOS is somewhat derived from TENEX, the nonstandard OS for the PDP-10.) Wikipedia tells me that NX-OS doesn't support per-user logins or scp, that it considers all access-lists as extended (about time -- I think IOS's way of handling acl's dates back to when people were running multiprotocol networks that handled more than just IP), and that it doesn't support the 'write' command and instead uses the 'copy' command, which I can live with. It's derived from SAN-OS, which I am also unfamiliar with. Looking at it, I'd say that even with the cards and power supplies and fans stripped out, you still need a 19" wide lift that can slide inside your cabinet to install it.